RACE for the Orphans, Inc. is excited to announce that four deserving families will receive grants through this year’s RACE for the Orphans Grant Program. Register to run or walk on May 5th at the 6th Annual RACE for the Orphans 5K to raise funds for these families to help them bring their children HOME! The more participants we have, the more grant money we can give each family! 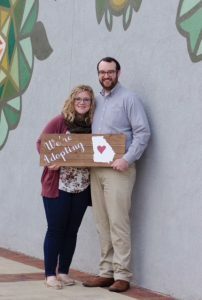 Ben and Chasidy have had adoption on their hearts for many years. 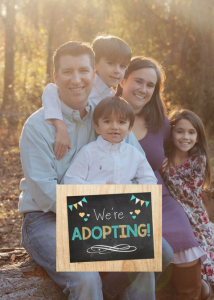 Chasidy was adopted by her dad and Ben is the biological son of parents who served in a Winshape Foster Home. Ben grew up with multiple foster kids in his home and he learned a lot about children in difficult situations. 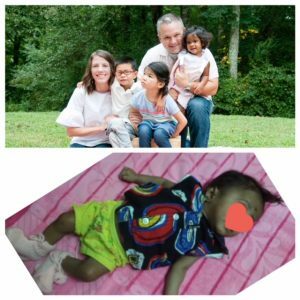 When Ben and Chasidy started looking into adoption, they had hoped for a child from Africa but soon realized that African adoptions were becoming very unstable. Therefore, they felt God leading them to pursue adopting a child from the United States and are open to any race. Meanwhile, Chasidy continues to be an advocate for orphans in other countries and families that are in the process of raising funds to adopt them. Ben and Chasidy live in Sharpsburg where Ben is a golf course superintendent and Chasidy works as a nurse practitioner. They have been blessed with three biological children, Sydney (9), Eli (8), and Liam (5). They are active members at Southside Church in Newnan. Matt and Kimber had the opportunity to visit India in 2011 and stayed in an orphanage. 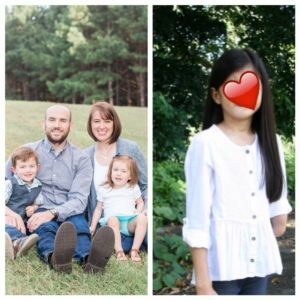 They say, “It was the trip of a lifetime to experience a place so exotic, to touch ‘untouchables,’ and to get to know children who have hope and joy in Christ.” They considered adopting from India after that trip, but God led them to adopt two children from China. Eventually they did return to India to adopt a little girl, and they are excited to be adopting another child from India into their family. Matt and Kimber live in Alpharetta with their three children, Teagan (8), Bennett (7), and Ruby (2). They look forward to returning to India, hopefully this fall, to bring their son, Cannon, home. Matt works as a software developer and Kimber works part-time with Birds on a Wire, a ministry for moms. They are active members at North Point Community Church. *For legal reasons, at this time, we cannot include a picture of the Burgess’ son’s face in India. Nick and Kate live in Sharpsburg with their two biological children, Jude (5) and Bethany (2). Nick works in industrial sales and Kate creates home decor which she sells online. They are active members at Coweta Community Church in Newnan. *For legal reasons, at this time, we cannot include a picture of the Hayes’ daughter’s face in the Philippines. Brian and Alisha live in Newnan. Brian serves as the pastor of Sargent Baptist Church, and Alisha works for the City of Newnan.